With over 50 years of manufacturing experience, a commitment to OE form, fit and function, and unparalleled technical support, Edelmann is your best choice for power steering replacement hose and parts. Edelmann OE quality power steering hoses and components are crafted from long-lasting, high-performing materials that ensure durability under the harshest conditions on the road. That commitment to OE form, fit, and function ensures ease of installation, correct hose/tube routing and leak free performance. Hose construction withstands internal oil temperatures of up to 300 degrees Fahrenheit, ensuring component integrity in high-heat, high-stress operating environments. High-tensile strength braided fabric helps Edelmann pressure hoses withstand pulsation pressures up to 1,500 PSI and bursting pressures that exceed 6,000 PSI. 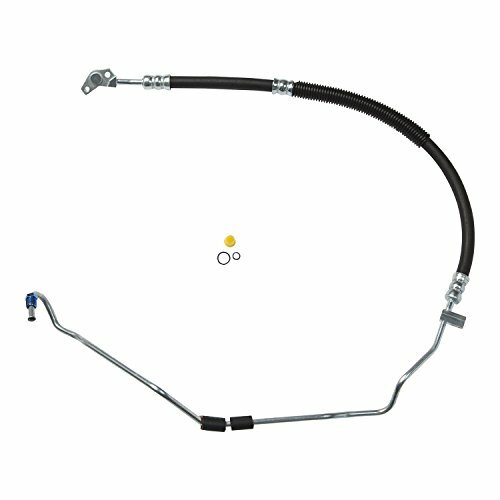 Edelmann power steering pressure hose covers are highly resistant to oil, heat and ozone which cause ordinary assemblies to fail prematurely. Flared ferrule ends prevent pinching or cutting of the hose at tight bend locations. Metal tubing is coated with a Zinc-Aluminum Alloy, with an Aluminum-Rich Epoxy topcoat, and the couplings and fittings are zinc-plated for rust and corrosion protection. If required for the specific application, mounting brackets, heat shields and convolute tube sheathing (to protect hose) are included. When replacing a failed hose, whether from leaking, bursting, hardening/brittleness, or sponginess, choose the Edelmann hose for your application to ensure a durable replacement that will give you peace of mind as you travel down the road. If you have any questions about this product by Parts Master, contact us by completing and submitting the form below. If you are looking for a specif part number, please include it with your message.